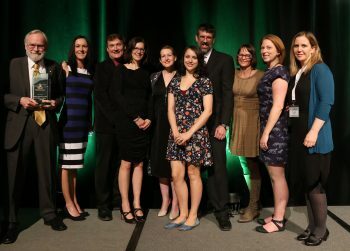 On April 22, 2018, at the Animal Welfare Leadership and Innovation Awards Dinner in Calgary, the UBC Animal Welfare Program was presented with the award for “Leadership and Innovation in Animal Welfare Science”. Receiving the award (from left to right) were Prof. David Fraser accompanied by Ms. Raegan Ahlbaum (Petsecure, host organization of the dinner) and Mr. Craig Daniell (CEO, BC SPCA) with Program graduates Nicole Fenwick (BC SPCA), Elisabeth Ormandy (Animals in Science Policy Institute), Erin Ryan (BC SPCA) Jeffrey Spooner (Agralytics, Ottawa), Catherine Schuppli (UBC), Sara Dubois (BC SPCA), and Lee Neil (University of Guelph). The dinner, which was attended by over 300, was organized by the Canadian Federation of Humane Societies (‘Humane Canada’), as part of the annual animal welfare conference.